Although recommended, work experience is not required during Part I studies. OVERVIEW: An exploration of the fundamental qualities and processes of design through a series of creative and analytical exercises. The course begins the process of establishing a basis in original thinking and ideation as an alternative to conventional solution and response. Meaning and creative technique in design and artistic expression are investigated through projects and studies involving the interactions of form, material, colour and light, and their application in non-architectural design. LEARNING OUTCOMES: To gain experience in fundamental thinking in design and the generation of ideas; to embark upon a critical understanding of visual ideas and meaning; to acquire skills in the communication and representation of ideas and concepts. Architecture 330 explores the creative process of design through a series of reading, investigation, and analysis of ideas in architectural form and relationships. By understanding how architects convey the ideas and values of society in built form, students will recognize the purpose of architecture as a cultural artifact. The course will introduce students to the process of critical thinking, help them to synthesize the information collected, and base their decisions on valid premises. An ability to develop a critical approach to architectural thinking and the ability for students to criticize their own work. The concept of establishing original and fundamental rather than conventional thinking is extended to architectural design. A series of projects, focusing on specific aspects and elements of architecture, provide the vehicle for exploring the basis of conceptual thinking in architecture, and acquiring insight into the characteristics and qualities of architectonic components. LEARNING OUTCOMES: To develop fundamental and imaginative thinking in elements of architectural design such as walls, roofs, openings, light and space; develop abilities in different media as both design tools and means of communication; to introduce the relationship of materials and structure to architectural expression; to develop theoretical understanding of these subjects. Architecture 200 examines the principles and ideas that shaped architecture and cities in the Ancient and Medieval worlds from about 3500 BCE to about 1400 CE. You will first examine how the principles of the Ancient World were altered after ca. 600 BCE in Classical Greece, Israel, Persia, India, and the Americas, and how the climax and collapse of the Ancient world can be read in the architecture of the time. Then you will examine the principles and ideas that shaped buildings and cities both by and for world religions from ca. 300 CE to ca. 1450 CE. By studying the course commentary, textbooks, scholarly articles, and visual and primary sources, you will learn about both this long and eventful period of the history of architecture, and how scholars study it. As you work through the six units, you will complete a series of exercises and assignments that will assist you in honing the skills necessary for future research projects. essential details: nomenclature, locations, builders, significant dates, and chronologies. visual evidence: original as-built, change over time, and current state. reasons for original construction: the beliefs, values, and intentions that motivated the builders, and how those are revealed in as-built plans, form, or decorative details. manner of use: the rituals, activities, and events the buildings were intended to accommodate. method of construction: the contribution of evolving technologies, types of building materials, and how geography, environment, and climate influenced their form and function. geopolitical, chronological, or ideological contexts for these structures and how they are the same as or different from other buildings that responded to similar stimuli in different times or places. OVERVIEW: An introduction to the holistic nature of architectural design through the integration of multiple criteria in the design of a simple habitat. The application of fundamental thinking in design is extended to complete architectural projects, where a greater range of architectural parameters have to be combined. Projects present non-conventional situations and programmes where standard solutions cannot be employed. LEARNING OUTCOMES: To understand and formulate a building programme incorporating qualitative and theoretical criteria; to introduce the considerations of design in a natural context; to understand appropriate materials and structure as formative elements in architectural expression; the further development of techniques in communication and media (e.g. models, verbal presentation); to introduce case study as an analytical and theoretical tool. OVERVIEW: Architecture 320 examines the development of architecture in Canada from the establishment of colonial settlements in the 1680s through to the development of architectural styles used in 1900. The course is organized thematically around questions pertaining to colonization, identity, and heritage, as well as, issues pertaining to First Nations. Students will explore architecture in Canada through a variety of perspectives noting the development of architectural styles in their social, cultural, and historical contexts. summarize key points in Canadian architectural scholarship. APST 230 introduces the characteristics and applications of construction materials, examining building systems, assemblies, components, and materials. The course develops a framework for the analysis of building materials, identifying their characteristics; exploring their impact on the environment and resources, as well as on occupant health; and examining the impact on them of environmental factors. After successful completion of this course, you will be able to exercise critical thinking in the process of selecting and applying building materials to the design of building assemblies, with particular focus on the building envelope. Describe the functions and characteristics of common building systems and assemblies, including building envelope, structure, environmental management systems, and building services systems. Discuss the characteristics of building components and materials including function, physical properties, grades, life cycle economics, embodied energy, availability, and the impact that materials’ production, use, and disposal has on the environment. OVERVIEW: The application of the principles of fundamental thinking in design to a project of greater scale and complexity, which approaches more typical situations but is still non-conventional. This project, or series of projects, provides the vehicle for the introduction of more complex considerations into architectural design, involving issues of community, amenity and urban context. LEARNING OUTCOMES: To introduce the consideration of design in an urban context; to develop pragmatic requirements of both practical and qualitative (theoretical) nature for multiple activities of small groups of people; to investigate considerations of amenity, spatial quality, light, view, privacy, interaction with climate and neighbourhood; to encounter organizational and qualitative issues of access, circulation, multi-use and limited use space. Applied Studies 240 introduces theories of statics and the strengths of the most common building materials: steel, timber, and concrete; and discusses relationship between architectural design and structural design in the generation of expressive form. Qualitative and quantitative analyses demonstrate the reaction of building elements to external forces. Illustrate the reactions of typical structural building components when forces are applied. Calculate the forces acting on, and reactions to, determinant structural systems and assemblies. Analyze load distributions in structural assemblies. Design structural members based on the analysis of loading, internal stress, and the strength of materials. Relate the expressive potential of structural components and systems to architectural design. The Certificate of Completion is issued when all courses within Part I have been successfully completed and an Academic Review conducted. Register as a Student Associate with your Provincial Association and begin using the CERB (Canadian Experience Record Book) to log work experience under the direct supervision of a practicing Canadian Registered Architect, for a minimum of 2,800 hours. OVERVIEW: The first of a series of design courses involving established building types of increasing complexity, which provide vehicles for different theoretical issues in design, imply different design procedures, and extend design experience in different areas. The cultural and recreational building type should provide experience in designing for public assembly, and by being located in a natural site situation could also provide an opportunity for issues of building in landscape and site analysis. LEARNING OUTCOMES: Theoretical and design issues of public assembly, natural context and landscape, and the relationship of programme and character; critical interpretation of a given programme; further communication and media techniques, e.g. portraying landscape concepts, didactics and display, theatres and illusion. ARCH 340 History and Theory of Modernism examines the history and theory associated with Modern architecture from the 19th century to the middle of the 20th century. Students will examine gradual erasure of historical symbolism and its replacement with functional approaches intended to address new social issues in architecture. Critical writings are resources to discover different cultural and ideological approaches to Modernism in Europe and North America. Identify and describe the main concepts of the Modern movement and its chief proponents. Explain the design criteria applicable to 20th century architecture in their relation to major events. Analyze how new planning processes were related to new materials, site, and structural processes. Discuss the relationship between architecture and the written word. Explore the relationship between architectural theory and practice. Describe architectural styles in terms of economic status, social hierarchies, and claims about group identity. Explain Modernism’s spread outside of Europe. Architecture 300 is a three-credit, senior-level course in which we examine the principles and ideas that shaped civilization and architecture from the end of the Middle Ages to the early Modern era (circa 1400–1800). Across Eurasia, Africa, and the Americas, architecture was used to promote and sustain states that were structured along hereditary class lines. We will chart the rise and fall of this idea, the creation of the modern economic state, and its colonial expansion. By studying the course commentary, textbooks, scholarly articles, and visual and primary sources, students will learn about both this long and eventful period of the history of architecture, and how scholars study it. As you work through the six Study Guide units, you will complete a series of exercises and assignments that will assist in honing the skills necessary for your research project. APST 340 will familiarize students with the detailed considerations of structural design, including quantitative load, stress and strain analysis, structural member design and most importantly the requirements set by the codes on design and construction of different types of structures. Design structural elements of normative assemblies in steel, wood and concrete using limit states analysis within the constraints of the National Building Code and other regulations and standards covered in the textbooks. 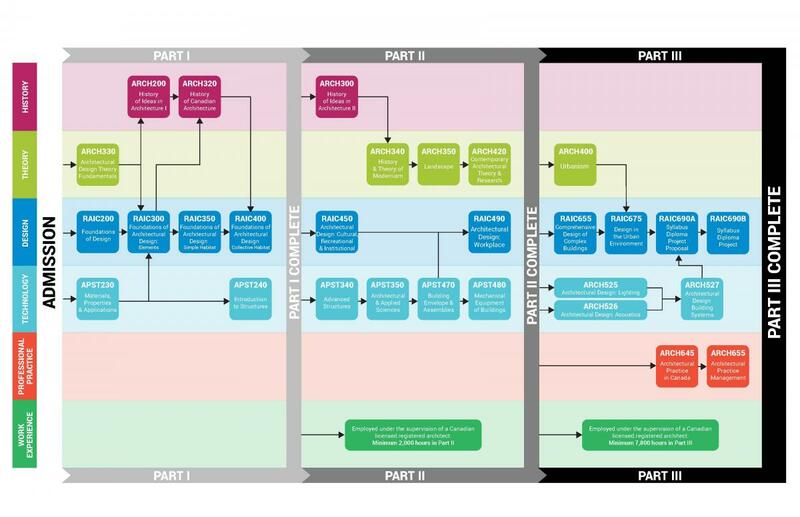 Analyze structural system design, from assemblies to connections, for the purpose of identifying and optimizing opportunities for expressive design. APST 350: Applied Architectural Sciences introduces the scientific basis underlying the design, analysis, and evaluation of the building envelope as a separator of different environments. The purpose of this course is to link theoretical knowledge to applications in practice. This approach will support an increase in evidence-based practice. This course presents both qualitative and quantitative techniques to relate the principles of equilibrium to building design to the climatic factors and principles that influence building performance, including solar radiation, wind, precipitation, temperature, thermal dynamics, and vapor migration. Discuss the relationships between building performance and environmental and climatic factors. Discuss the concepts of heat transfer, thermal gradients, thermal bridges, air leakage, convection, and stack effect. Predict the responses of common building assemblies and materials to climatic cycles through a systematic analysis of environmental factors including radiation, precipitation, heating, and cooling. Discuss the impact that buildings have on the microclimate of their environment, including such factors as snow drifting, shading and reflection. Relate the performance of windows and mechanical systems in passive and active building systems. OVERVIEW: The study and design of typical building forms and programmes within the general category of workplace, with a view to exposing issues of workplace quality, architectural character, and the imaginative integration of technical aspects into design. LEARNING OUTCOMES: To gain experience in alternative approaches to design techniques; to engage in further theoretical issues including the integration of technical requirements into design, character and context; to develop further applications of communications and media, e.g. computers. Architecture 420: Contemporary Architectural Theory and Research examines contemporary architectural theory and practice from the late 1960s to the present. A number of issues and values will be explored through theoretical essays, critical writings and lecture presentations that expose the diversity of contemporary architectural thought and practices. The first part of the course explores opposing positions and values that coexist within various time frames in both local and global contexts. Course learning activities and assignments are designed to help students understand the theoretical underpinnings that inform and/or explain architectural practices. The ability to apply this knowledge in articulating an architectural proposal with clear personal positioning is essential for students entering graduate level studies. Throughout this course (and beyond) you will be called upon to observe the built environment around you. The built fabric of your city or town is composed of buildings and spaces produced over a long period of time. When you look at contemporary architecture, that which was built beyond the 1960s, what differentiates it from architecture of the past? What are the ideas and values embodied in architecture of a past period that make it still valuable today in your community? What are the ideas and values underlying what we are building today that will ensure significance and relevance fifty years from now? different design problems if you had been given the mandate? You will have to formulate a problem of your choice, a design or technical issue that would sustain your interest and could be relevant for the community around you, in order to develop a research proposal at the end of the course. While the subject might change later on, it’s the thinking process that you will develop throughout the course that will guide you in formulating and situating the project. Make it a reflection of you, your values and ideals! OVERVIEW: APST 470: Building Envelope and Assemblies focuses on the application of building science principles to the design of building enclosures. This course examines various elements that mediate between the interior and exterior environments, both above and below the ground, in manners appropriate to their intended function and performance. Case Studies of building enclosures and their components illustrate the importance of having a comprehensive understanding of building materials and building processes. Wall sections and other building details are used to identify strategies to achieve sustainable and high-performance buildings in various climates. Evaluate existing buildings conditions and identify methods for their improvement. You will find that the assignments and the study questions in this course are formulated to challenge you to respond in a manner that demonstrates the ability and level of understanding stipulated in these overall objectives. Architecture 350 provides an introduction to the theory and practice of landscape architecture with an emphasis on sustainable design. Through readings, directed observation and critical review of examples of professional projects, the student will be exposed to landscape planning and design concepts and examples of their application in practice. The role of social, economic and aesthetic values in shaping the landscape over time and a range of environmental issues will be introduced with reference to the idea of sustainable development. Technical aspects of site planning and design and how these might be applied to the principles of sustainable design through observation, documentation, and critical appraisals of project design, readings, and the review of projects and case studies. OVERVIEW: Applied Studies 480 Mechanical Equipment of Buildings provides an overview of the fundamentals of the design of mechanical systems for buildings. This discussion will include the relationships between building envelope design and mechanical system design, particularly with regards to sustainability, energy use and human comfort. Basic components and equipment involved in mechanical systems will be discussed, as well as their place and integration in the development of design concepts. An understanding of mechanical system terminology and an elementary knowledge of sizing procedures and system controls will be developed. At the completion of this course you will be able to demonstrate an integrated approach to the coordination of building mechanical systems and sustainable design principles to arrive at a cohesive, holistic building design. describe the function, characteristics, and operation of mechanical systems in buildings, including heating, ventilation and cooling systems, water supply, drainage systems and fire protection systems. relate the function, characteristics, and operation of mechanical systems in buildings to the overall design concept, sustainable design principles, building construction and operational strategies. relate the physiological processes of human temperature regulation to the body’s perceptions of comfort, the external environment and the building envelope. perform basic heat transfer calculations. estimate approximate sizing of ducts and other mechanical system components in the early stages of a project to ensure that the design concept is viable. evaluate the interrelationships between building mechanical systems and other systems, such as envelope, structure and comfort. The Certificate of Completion is issued when all courses within Part II have been successfully completed and an Academic Review conducted. NOTES: Upon Registrar approval, Professional Practice Courses, may be taken prior to, concurrent with, or following completion of RAIC690. Continue registration as a Student Associate with Provincial Association and using the CERB to log work experience under the direct supervision of a practising, Canadian Registered Architect for a minimum of 7,000 hours. OVERVIEW: The continuation of the study and design of significant building types with the investigation into the nature of institutions. The course focuses on larger fairly complex buildings with significant organizational demands, and which present issues of the cultural and symbolic role of public buildings and their historic role in society. LEARNING OUTCOMES: Alternative approaches to design technique, e.g. integration of organizational, cultural and symbolic requirements into design; development and application of further communication and media, e.g. involvement of clients, statement of theoretical position; further theoretical issues including the cultural and symbolic role of buildings, typology; further experience of building types. and sustainability, will be addressed and debated. Define urban morphology and its component elements through the evolution of the city with an emphasis on the emergence and creation of archetypal urban space. Describe the characteristics of the typology of urban space based on a familiarity with historic examples. Distinguish among traditionalist, modernist, and postmodernist approaches to (or theories of) urbanism, with a particular emphasis on the late-19th to late-20th century changes to the North American city. Analyze existing urban conditions and urban issues through the application of conceptual and graphic tools typically used by the contemporary urbanist/architect. Architecture 525: Architectural Design: Lighting introduces the art and science of light and lighting. It discusses the interaction of light, lighting application technologies, and their physiological and psychological impact on people. It focuses on visual characteristics, interrelationships with adjacent systems, performance, and cost efficiency. The course will give you an understanding of techniques for evaluating an illumination design for a space considering a wide range of criteria, including perception, physiological requirements and impacts, system efficiency and effectiveness, and sustainable design. OVERVIEW: This course is intended for students in the Post-Baccalaureate Diploma program in Architecture, or for those international architecture graduates referred by the CACB. It examines both the theoretical and practical aspects of architectural practice in Canada. The focus of this course is on acoustic theory and practice as it pertains to architecture and design. This course will explore the physics and perception of sound, the characteristics of sound and vibration in spaces, and their place in the development of holistic design concepts. Qualitative and quantitative methods in acoustic analysis will be presented and discussed. The student will apply acoustic design criteria, methods, and materials to spaces for various activities and functions, from theatres and concert halls to open-space offices and hospitals. Issues of acoustic privacy and confidentiality and of sound reinforcement will be examined. Relate the scientific principles of acoustic design to the design and construction of comfortable spaces. OVERVIEW: The investigation and design of urban communities, involving principles of urban theory, environmental considerations and design of multiple housing types. As the final major building type of the series to be studied, housing is considered in the context of the urban structure in which it is located, and therefore prefaced by a major study of urban theory and design of an urban area. It is thus not arbitrary, nor zoning or developer driven, but informed by a full range of theoretical and design criteria. A significant aspect urban habitat design are environmental concerns, including the design of landscape. LEARNING OUTCOMES: To develop the student’s attitudes and powers of observation and interpretation, their critical approach to unconventional thinking on the question of what makes the city, and create an understanding of urban design that incorporates a sophisticated reading of the urban condition and the development of skills to implement creative and viable solutions to real problems. Architecture 645 explores the theoretical and practical aspects of Canadian architectural practice. Architecture is never created in isolation; therefore the various stakeholders involved in the design and construction of buildings (such as builders, Authorities Having Jurisdiction, consultants, owners, and clients) and their relationship to the architect are explored. The course not only includes the current context in which architects practice and the laws and regulations that govern their practice in Canada, but also looks to the future and the position of the architect in society and around the globe. Describe the general purpose and content of the Architects Act and its regulations of the jurisdiction in which you work. Apply Codes of Ethics in everyday practice. Develop a personal conviction on the role of the architect in society. Nurture appropriate professional relationships and administer the contractual role of the architect with others in the design and construction industry (e.g., clients, Authorities Having Jurisdiction, consultants, and building product manufacturers). Apply building codes, standards, and other regulations to the design and construction of buildings. Analyze how architectural practices may be organized and know the regulations governing the formation of a practice. Discuss potential new leadership roles for architects. OVERVIEW: This course is intended to provide you with an in-depth understanding of the integrated design process, including analyses, of designing high-performance buildings.In an increasingly demanding economic, design, and construction environment, the performance expectations of buildings escalate while expectations of capital and operating costs decrease. Architects and engineers are expected to consider a wider range of design constraints and considerations and at the same time to work with greater efficacy. To address these systemic changes, the integrated approach to the design and analysis of building systems is increasingly being used.This course is intended to increase your understanding of major buildings systems, from the standpoints of design requirements for human occupancy, through a detailed examination of a design process that stresses integration and a comprehensive approach to building energy analysis. Discuss the value of whole-building energy simulations as part of the integrated design process. OVERVIEW: Architecture 655: Architectural Practice Management integrates the study of management practice within the context of architecture as a profession. This course provides the necessary skill sets that architects use in the development of a successful practice. It challenges the graduate student to consider management practice issues that architects must consider and promotes strategic evaluation of project design and process. OVERVIEW: The Thesis is the culmination of the Syllabus in which students undertake a major work of their own choice. There are two stages to the Thesis described under separate courses – D9A and D9B. The Thesis project usually will result in an architectural solution to a stated theoretical position, but may also be a major analysis of issues in architectural theory, history or other fields of enquiry related to architecture. The Research Project includes selection of Thesis Committee (Mentor, External Advisor, and Second Advisor); Project Proposal Outline (statement, literature search, methodology, submission); Research Report, architectural program, data analysis, initial presentation, schematic design, interim presentation, final development, submission and presentation, and formal documentation and submission to the Director. LEARNING OUTCOMES: To develop the research component of the thesis, i.e. : a literature search and review of documented material that is relevant to the issue selected, including precedents in the field of both theoretical and built forms, critically analysed and used to establish intentions and approach to the selected theoretical position and project. Final development, presentation and documentation of a design solution or major analytic study in theory, history or other fields of enquiry. The Diploma in Architecture is issued upon Completion of RAIC Syllabus Part III, following Academic Review.